In accordance to the revenue management techniques, the rates applied can vary taking into account availability, period of stay, booking period and other variables. Special discounts are applied in case of prepayment of the amount of the entire stay: advanced booking fee – not refundable in case of cancellation. The reservation can be made online directly from our site or with the use of the contact form – In this case, you send the email with the request for availability in the desired period and wait for our response with the relevant offer (non-binding). The reservation is to be considered confirmed only after the payment, as soon as possible, of the deposit that can be made by bank transfer or by credit card. For the bank transfer the hotel’s IBAN is provided by the reception; while with the credit card details sent by you, the reception makes the authorized withdrawal. The confirmation is communicated by email together with the arrival and departure dates and the amount of the balance to be paid upon departure. Please check the accuracy of the confirmation data and notify any anomaly as soon as possible. The amount of the deposit is equal to 30% of the amount for stays up to 10 nights, while for longer stays at 50% of the total amount. For groups (from 4 rooms onwards) the amount of the deposit is equal to 50% of the total amount of the stay. For bookings made in a very short time compared to the date of arrival and therefore without the time needed to proceed with the transfer of the deposit, you must provide the credit card details at the time of booking. The extension of the stay compared to the period already booked is subject to availability and rate changes. 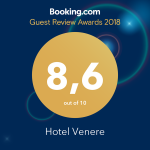 Where provided the use of credit card details, Hotel Venere reserves the right to check the validity of the credit card before the arrival of the client requesting a preauthorization of the circuit to which it belongs. NO AMOUNT IS COLLECTED. In case of pre-authorization with a negative result the customer will be notified and the reservation will be delited. In this case the hotel will have no obligation towards the customer. Any cancellation or modification of booking must be communicated in writing by e-mail referring to the booking confirmation. If the booking is moved to a period when the rate is higher, the customer is required to pay the difference. For booking made online, cancellation up to 3 days before the date of arrival is without penalty. For cancellations beyond this term, the cost of the first night for each room canceled will be charged on the credit card as guarantee date. For cancellations on the date of arrival or in case of “no show” the full amount will be charged. For booking made with payment of the deposit, the cancellation does not provide for the reimbursement of the amount paid; the customer can reuse the deposit paid for himself or his relatives for bookings within a year, taking into account availability and rate changes. For booking made online, the cancellation up to 5 days before the arrival date is without penalty. After this deadline the penalty is 50% of the amount of the stay and in any case not less than the cost of the first night of stay. For booking made on line, cancellation up to 5 days before the date of arrival is without penalty. For cancellations beyond this term, 30% of the total amount of the booked stay will be charged on the credit card given as guarantee. For booking made with payment of the deposit, the cancellation of the reservation does not provide for the reimbursement of the amount paid; the customer can reuse the deposit paid for himself or his relatives for reservations, even if distributed over time, to be carried out within a year, taking into account availability and rate changes. For booking made online, cancellation up to 10 days before the date of arrival is without penalty. After this deadline the penalty is 50% of the amount of the stay. In case of “no show”, the amount of the entire stay is charged. In case of NO SHOW the deposit will not be reused. No refund is due to the guest who interrupts the already begun stay and therefore he is required to pay the entire booked stay. Advance booking, “Non Refundable” If the reservation was made with this special rate, in case of cancellation, the full amount is not refundable under any circumstances. For cancellation received within 40 days before the date of arrival, the deposit will be refunded. For cancellations received within 20 days before the arrival date a penalty of 50% of the entire stay of the rooms and / or nights canceled is provided. For cancellations after this deadline and until check in, or in case of “no show” the penalty is 100% of the entire stay of the rooms / nights delited.